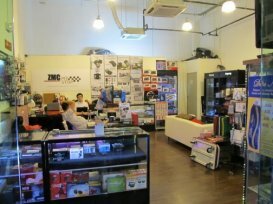 ZMC Automotive is the exclusive distributor for Thinkware products in Singapore. It also distributes other established brands such as Parrot and Steelmate, etc. Incorporated in 2007, the company has now expanded to include an online retail store that provides free shipping. Whether you're looking to enhance the aesthetics of your car's cabin or to improve cleanliness, you can kill two birds with one stone thanks to Matters. Products after products, ZMC Automotive has never failed to deliver. From car alarm, to the grooming products and dash cams... My favorite accessories shop by far. Great service and Fantastic products! Installed my Thinkware F770 with them. The installers were very experienced and professional. Neat and concealed wiring. The sales staff were friendly and knowledgeable. I went to the shop to purchase Parrot Minitkit Neo bluetooth car kit yesterday after calling to find out more on hands-free car kits. I spoke to Lexus on the phone, he was very helpful and informative.